Alongside the fresh new San Francisco font and the News app that replaces Newsstand, the biggest change to the iOS 9 home screen may be the arrival of Wallet, the rebranded name for the former built-in Passbook. However, the update isn't simply cosmetic: There are a few new features and improvements coming along for the ride, although some of them haven't been enabled quite yet. Let's take a quick look at what's new. If you've been hanging onto a Discover-branded credit card in a physical wallet lamenting the fact that Apple Pay doesn't support this preferred payment method, your long, national nightmare comes to an end with the update to iOS 9. Discover cards can be added to Wallet on iPhone 6, iPhone 6 Plus, iPhone 6s, and iPhone 6s Plus devices as well as Apple Watch, and requires nothing more than a quick verification by text message, email, or phone call. Only a year late, Discover finally joins the Apple Pay fold with iOS 9 Wallet. 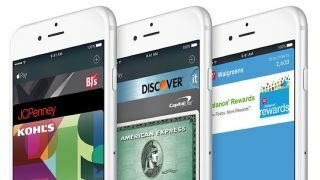 The iOS 9 Wallet app will also mark the arrival of retailer-specific credit cards to the Apple Pay fold, with Best Buy, BJ's Wholesale Club, JCPenney, and Kohl's already lined up to support the feature. Apple has yet to announce when store charge customers can add such cards, though — we tried while writing this article using our Best Buy card, but it came back ineligible. Once available, adding a supported store-branded credit card is exactly the same as Visa, MasterCard, Amex, or Discover: Tap the plus sign in the upper right corner of the Wallet, then follow the on-screen instructions to snap a picture of your card and verify with the three-digit code on back (four on front for Amex); cards can be added to Apple Watch using the built-in app. Apple hasn't enabled support for store credit cards yet, but when they do, you'll be able to add them to Wallet just like other cards. Although Apple Pay has always worked without unlocking your iPhone, accessing the cards stored in Passbook often required drilling down into the app itself or being near a supported retail location that would automatically offer to display a loyalty card via push notification. iOS 9 makes things a bit easier on us all with a new shortcut: Just double-click on the Home button while your iPhone is locked, and up pops the Wallet app with your default payment card ready for action, and all of your other credit cards, store credit cards, and loyalty cards just a tap away. Although the previous Passbook app was often convenient for adding certain types of rewards cards, it wasn't always clear who actually supported them. iOS 9 promises to expand the available options by receiving and redeeming rewards automatically whenever you use Apple Pay. Already announced is support for Dunkin' Donuts DD Perks, Walgreens Balance Rewards and MyPanera, and Apple's official screenshots also tease My Coke Rewards, Kohl's Yes2You, Wegmans Food Markets, and Starbuck's, which previously offered a Passbook for gift card payments and racking up points. As of this writing, however, this feature of Wallet has yet to be implemented. Rack up and redSoon, you won't have to worry about carrying around physical rewards cards anymore. Though not a new feature per se, there will be plenty of new retailers ready to accept Apple Pay on your iPhone or Apple Watch this year. Announced during the iOS 9 unveil back in June, Best Buy lit up support for the mobile payment service in its retail stores last week after accepting Apple Pay for in-app payments earlier this year. Other retailers with upcoming support for Apple Pay include B&H Photo, Baskin Robbins, BevMo!, Big Lots!, JCPenney, Jonny Rockets, Kohl's, LEGO, Dunkin' Donuts, El Pollo Loco, Express, Forever 21, Levi's, Peet's Coffee, Trader Joe's, and White Castle. Now supporting all major credits, Apple Pay and iOS 9 Wallet can also be used at more retailers than ever before. Last but not least, scores of small retailers will soon be able to jump into the Apple Pay action, thanks to Square integration courtesy of new reader hardware. You can bet there will be plenty of additional retailers jumping on board Wallet and Apple Pay in the very near future as well.